Samsung has announced a new line of 2,500 nit high-brightness displays in sizes ranging from 46- through 75-inches, with those system on chip media players built in. The OMD series displays are more than bright enough to park in high ambient light environments, as well as outdoor – the latter needing custom-designed weatherproof enclosure. The panels have contrast ratios of 5,000:1, use LED backlighting, and have automatic brightness sensors to turn up and dial back the glow as needed. They also have something called circular polarizing technology, which Samsung says lets people see what’s on the display even if they are wearing polarized sunglasses. The units come ready-to-mount displays for indoor, and as kits for outdoor enclosures. They have DisplayPort connectors and the other connector stuff, serial control, and they are rated for 24/7 use. There’s a three-year onsite warranty. Really nice products, had the chance to see them pre-launch and already have several partners and customers looking to deploy them next year. 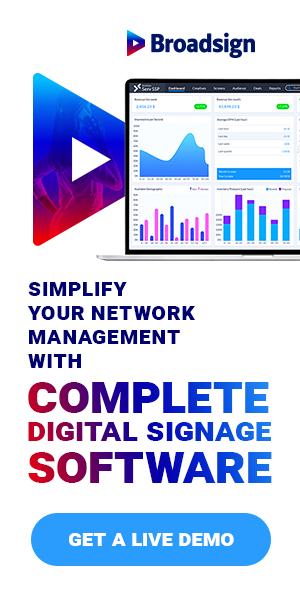 With the 10″ and 22″ both with or without touch, and now high-bright displays all with the Smart Signage SoC baked-in, Samsung have a comprehensive range of Smart Signage Displays going into 2015.